Many people want to learn another language but can’t figure out which one they want to learn. Figuring out which language you want to learn can either be really easy or extremely difficult. There can also be a few different reasons why people would want to learn a language. Some studies have shown that over half the worlds population is bilingual at least. Because of that, many people would want to know how to learn Norwegian fast, or any other language. The connections you can make with people when you learn a new language can be surprising, so you might want to know how to learn Norwegian fast so that you can move on to another language. As we alluded to above, the world is quickly becoming more and more multi-cultural; because of that, more and more people are becoming bilingual. With that in mind, if you’re not learning a second or even third language, then you’re quickly falling behind many of your peers regarding language skills. This also means that you can open up new job opportunities for yourself. As the world is becoming increasingly connected, markets are becoming more and more intertwined; this is leading more companies to recruit native-level speakers for critical positions. Having fluency in Norwegian or any other language sets you up perfectly for these kinds of opportunities. Speaking of jobs, this could also mean moving to Norway to be based there; with fluency in Norwegian, there’ll be no issue there. The same is also the case if you just wanted to move to Norway; a high level of fluency in Norwegian means that you’ll have no issue in becoming friendly with the neighbors or any work colleagues. Learning a new language brings the world within your fingertips; the more languages you learn then, the closer you’ll feel to connecting with other parts of the world. Speaking a new language opens up some opportunities that wouldn’t have been there before; new adventures, job prospects and even living and travel. If you’re curious at all about traveling the world, then the first step is to learn a new language to help you on your journey. Norwegian is often considered the most straightforward languages to learn for English speakers. The two have similar sentence structures and even share a few cognates – words that look or sound the same in more than one language. While the pronunciation is different, this can be picked up quite quickly and can turn out to be pretty fun. Not only is it fun and easy to learn, but if you’re planning on learning any other Germanic languages, then it can be a significant help when it comes to speaking them. 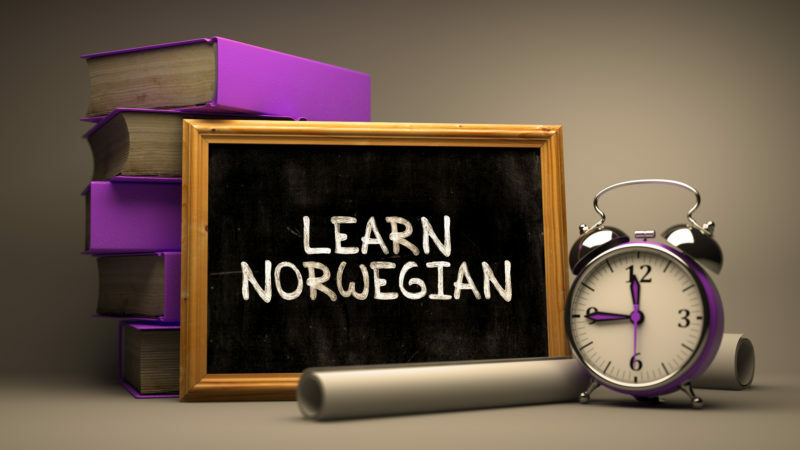 There are some benefits to learning Norwegian, many of which we’ve alluded to above. There are a few more benefits that you might be surprised at. Chief among these is the options it gives fluent speakers; it can open up some job and travel opportunities while also letting you live in Norway while still be able to converse naturally with neighbors and work colleagues. Regarding work, it can end up being a massive bonus. Because so very few people outside of Norway speak the language, it can make your C.V stand out. In many international companies you could end up becoming the Norwegian specialist for your company, or at least be relatively high-up the food chain when it comes to Norway focused positions. Learning a language also provides you with some brain training; this will help to improve your memory and help to keep your brain active and healthy. The more you learn a language, the more connections between your neurons will be created. This will significantly boost your memory and improve your problem-solving skills. And that’s before we even get to the bragging rights that come with being one of the few people in your immediate circle of friends that can actually speak the language. Although Norwegian isn’t spoken too much outside of Norway, it’s relatively easy to find somewhere to actually learn it. With that in mind, there are a few different ways to choose from to learn Norwegian. This is the most traditional way of learning Norwegian, but it’s also one of the most effective. Many high school students are given this option, but very few take up the chance to study it properly. However, there may be some Norwegian classes near you, so it’s worth looking around for what’s available. If you don’t want to go to a class with a few other people, then you might consider getting a private tutor. While these may be expensive depending on the tutor themselves, they can be quite effective when it comes to learning Norwegian fast. However, how fast you can learn it depends on how often your tutoring sessions are and the effectiveness of your tutor. Audio courses have been available for most languages for years and is a great way to learn specific words and phrases. Eventually you’ll be able to speak Norwegian pretty fluently. However, it does come with the caveat that you won’t be able to read or write Norwegian, so you may end up needing to learn that separately. Once you’ve mastered the oral side of Norwegian, though, the written part of it can come quite naturally. Online courses steadily grew in popularity throughout a few years and had proven to be quite useful in learning Norwegian fast. Not only can you learn Norwegian at your own pace, but you’ll be able to personalize your learning experience to some degree. In the last few years, though, apps have been overtaking online courses when it comes to how popular they are with learning languages. With an app, users have more control over when and where they learn, meaning that they’ll be able to learn on the way to and from work or anywhere in between. Many of these apps also allow more customizability when it comes to what aspect you’re learning and how you want to go about learning it. Similar to online courses, they’re regularly updated and improved, so you can gain access to more features over time, as well as learn a few other languages when you’re done learning Norwegian. With that in mind, what’s stopping you when it comes to how to learn Norwegian fast? A whole new world of opportunities awaits once you’ve mastered the language. With over 5 million native speakers and an entire country waiting, there are a lot of Norwegian conversations waiting to happen.